avast! Browser Cleanup is a small utility produced by the well-known antivirus developer. It is actually a simple program which assists you in removing addons, extensions and toolbars installed in Chrome, Internet Explorer and Firefox. Though you're likely to find some success with avast! Version 12.1.2272.125 is a freeware program which does not have restrictions and it's free so it doesn't cost anything. For security reasons, you should also check out the Avast! Browser Cleanup download at LO4D.com which includes virus and malware tests. Additional screenshots of this application download may be available, too. 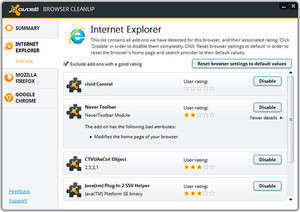 Avast Browser Cleanup download been highly rated by our users.